Ever Dundas, Goblin, Saraband, 2017. Goblin is an oddball and an outcast. But she's also a dreamer, a bewitching raconteur, a tomboy adventurer whose spirit can never be crushed. Running feral in World War II London, Goblin witnesses the carnage of the Blitz and sees things that can never be unseen...but can be suppressed. She finds comfort in her beloved animal companions and lives on her wits with friends real and imagined, exploring her own fantastical world of Lizard Kings and Martians and joining the circus. In 2011, London is burning once again, and an elderly Goblin reluctantly returns to the city. Amidst the chaos of the riots, she must dig up the events of her childhood in search of a harrowing truth. But where lies truth after a lifetime of finding solace in an extraordinary imagination, where the distinction between illusion and reality has possibly been lost forever? Dead things can’t die; weirdos always find each other. These two statements, from Scottish author Ever Dundas’s terrific debut novel, contain between them much of the meaning of the book, and much that makes it moving. It is a celebration of freakery, of creating one’s own family; a meditation on trauma and loss and abandonment (in both senses of that word) which, somehow, is never bleak.Goblin brims throughout with a kind of reckless joy. The story switches regularly and rapidly between past and almost-present, mostly in London: between the firelit city of the blitz and the firelit city of the 2011 riots. Goblin, when we first encounter her, is an 81-year-old reader-in-residence at Edinburgh’s Central Library, where she is kept company by Ben, a homeless man eating his way through Ulysses, page by page, chowing down as if it were a gorgonzola sandwich. Goblin is the name her mother used for her; a term of hatred that she has reclaimed. One day, she reads in the newspaper about the discovery in Kensal Green Cemetery of a macabre buried cache – doll parts, bones, a camera. The film, when developed, is of interest to the police. This provokes in Goblin intrusive thoughts of her childhood in London. Things that were buried are coming to the surface. Little moments bring on memories: a dizzy spell, a sip of whisky, the cooing of pigeons; suddenly, we are back in 1941 and she is a semi-feral girl, an androgynous urchin with a head full of HG Wells and Bride of Frankenstein, and a bedroom full of strays. About those strays. Neglected and emotionally abused by her mother, Goblin shows love and mercy to animals made homeless by Luftwaffe bombs or otherwise threatened by life on the home front. A crucial plot point has to do with the so-called “pet massacre” of 1939 when, in the first four days of the war, an estimated 400,000 animals were put down by Londoners worried that they would not be able to feed or care for them. One of Dundas’s aims with this book, she has explained, is to challenge the romantic consensus around the second world war and, as Ballard said of Crash, to “rub the human face in its own vomit and force it to look in the mirror”. In her descriptions of the pet massacre, she gives us the vomit – literally – and a horrific, unforgettable image: a Golgotha of cats and dogs, corpses piled in a stinking hill, a foreshadowing of what would be found upon the liberation of the death camps. As well as animals, Goblin’s other comfort is language. She is a storyteller, potty- and poetry-mouthed, cursing and versing, “weaving tales, spinning words into nets”, as one character puts it, until “no one knew what was true any more”. She creates a personal mythology based around her reading of science fiction and the Bible, anxiety about German invasion and the delusional ramblings of a local eccentric, the Crazy Pigeon Woman of Amen Court. Any experience, no matter how personally traumatic, is understood in the context of this myth: real life is held at a distance, where it cannot hurt as much. 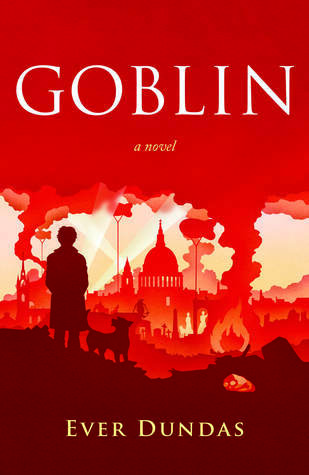 Goblin is a picaresque; in what are arguably the best passages, the heroine sets out to walk from Cornwall to London, a revacuee heading back to the blitz, to rubble and trouble, with her pet hog, Corporal Pig, trotting at her heels. There is so much energy and delight in that chapter, but Dundas can do stillness too. She is an accomplished creator of tableaux. The plot scoots along, breathless, deathwards, so fast it blurs, when all of a sudden – snap! – it seems to freeze on artfully composed scenes: girls in gas masks playing skipping games; a teenage boy lying in his bedroom, Dietrich on the wall, Liszt on the gramophone, smoke in the air; a child floating, drowned, on a bombsite, her dirty blond hair “like a messed up halo”. What Dundas reveals, again and again, is the mildewed wall behind the Keep Calm and Carry On poster. Her wartime London is rendered with such eldritch vivacity that the story loses considerable energy, though not fatally so, when it moves on and Goblin grows up.